As flood waters began to recede in worst-hit Algapur revenue circle in Hailakandi district of Assam , the people started to move back to their homes from the relief camps and centres. Following this, the number of inmates lodged in five relief camps and centres has come down from 16,411 to 9,227 in the past 24 hours. The number of affected villages has gone down from 40 to 16. Of the 16 villages reeling under floods, four fall in Kalinagar and 12 in Bokrihowar under Algapur revenue circle. 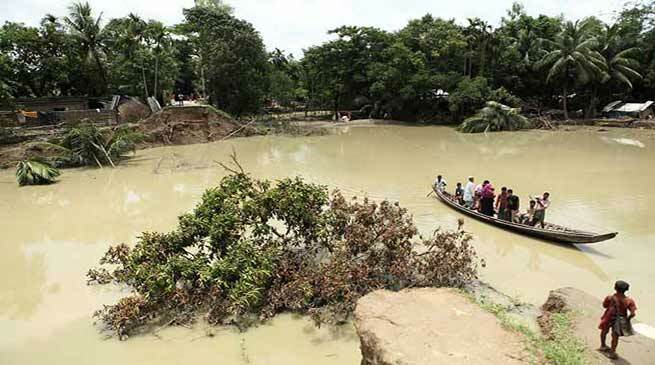 The district administration has completed the preliminary survey of the extent of damages to roads, bridges, property, embankments, dwelling units, cropped land and affected livestock and now making final assessment of the damages in those parts of the district where flood waters receded. Deputy Commissioner, Adil Khan said that at the directive of the Chief Minister, the officials of the district administration and concerned departments are carrying out final assessment of the damages caused by floods in areas where flood waters receded. Chief Minister Sarbananda Sonowal during his visit to Hailakandi on Saturday to take stock of the flood situation directed the administration to submit the final flood damage assessment report once the flood waters receded. “A preliminary survey of the damages caused by the deluge has been already completed. However, the final estimate can be made only when the flood waters recede,” said Khan. The current wave of floods has hit 3,24,258 population, the highest among the flood hit districts of Assam. Two lives were lost and ex-gratia provided to the next of kin of the deceased within 48 hours. 8,478 marooned people evacuated by SDRF and NDRF personnel. The floods affected all the four revenue circles covering 235 villages. Crop area affected by rising water levels has been put at 2,484.65 hectare. Altogether 20 numbers of embankments were affected, including six breaches and seven cut outs across the district. In terms of infrastructure, 75 roads, culverts and bridges damaged under PWD (Rural Roads), five roads under PWD (State Roads), 67 schools fully and 573 partially affected, 10 piped water supply schemes hit, 38 health institutions affected, 104 electric poles washed away affecting around 43.2 km of line wire. 1,11,690 livestock, big and small, were affected with floods accounting for the death of 64 animals.